'We’ve taken a job-by-job approach with a focus on expanding economic development opportunities for our citizens,' said Sarah Lankford Sprecher, Washington County, Md. assistant county administrator. Under the guidance of the Washington County Board of County Commissioners, Washington County’s unemployment rate has fallen to 6.4 percent in April 2014, down from 7.3 percent in March. Despite the challenging economy, the Commissioners are pleased to announce the 4.5 percent drop in unemployment under the current administration. Over the past four years, County Commissioners collaborated with the private sector to create jobs and support expansion projects including Baltimore Mack, Duvinage, Dynamark Monitoring, Freightliner, Lehigh Phoenix, Parker Plastics, Pittsburgh Institute of Aeronautics, and Volvo Group, among others. Since 2009, Washington County’s median household income has increased by about 25 percent, raising the bar and incomes for Washington County families. The current income is $54,239 up from $41,984 (1). Washington County even out paces the national average for median income by 6 percent. According to the Washington County Economic Data Summary, the County has also seen a 9.5 and 2.5 percent increase in information tech and professional and business services jobs, respectively. With unemployment decreasing, median incomes and County income tax revenues have increased over the past four years. With more citizens back to work, the County has seen an increase of approximately $6.5 million in income tax revenue and projections indicate approximately $2 million more in revenue for fiscal year 2014. Strong fiscal management and positive economic development indicators also helped the County secure a AA+ rating from Standard & Poor’s. 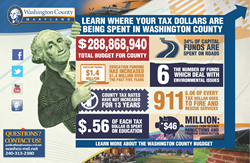 A success managed despite the County’s absorption of more than $46 million from revenue reductions over the past several years while maintaining all government services – without a County tax increase in 13 years.